It’s been a long time since the bathroom became a lot more than a mere washroom. One of the key spaces in a modern home, the room in which we take care of our hygiene surpassed its practical nature by diving into the upper levels of aesthetics and even hedonism. Hardly a new notion, bathrooms are a present embodiment of one-time oriental steam baths, ancient beauty parlors or nordic sauna retreats. And despite the space limitation, they tend to go back to their very original functions and become oases of tranquility. This way, they are not utility rooms anymore, but places where we can relax, enjoy ourselves and the beneficial effects of water, aromatherapy, and cosmetics. Bathrooms can become in-house mini spas, despite their size, although big spaces offer more possibilities. Still, from the powerful shower head to the spacious bathtub, we must not forget one very important aspect of this facility – the atmosphere. When building a hedonistic bathroom, high-quality tiles are the usual go-to material, but there is one element that can lift the whole result to a new level – mosaic. Used in thermae and ancient bathhouses, mosaics still fit the purpose perfectly as humidity resistant, durable and beautiful solution. Moreover, they give a bathroom a particular sense of luxury regardless of the style and offer many solutions for the long-term decoration of the space. A fitting bathroom in a stylish home can become its crown, especially when decorated with stunning mosaics that can cover either portions or the room, or the entirety of it. 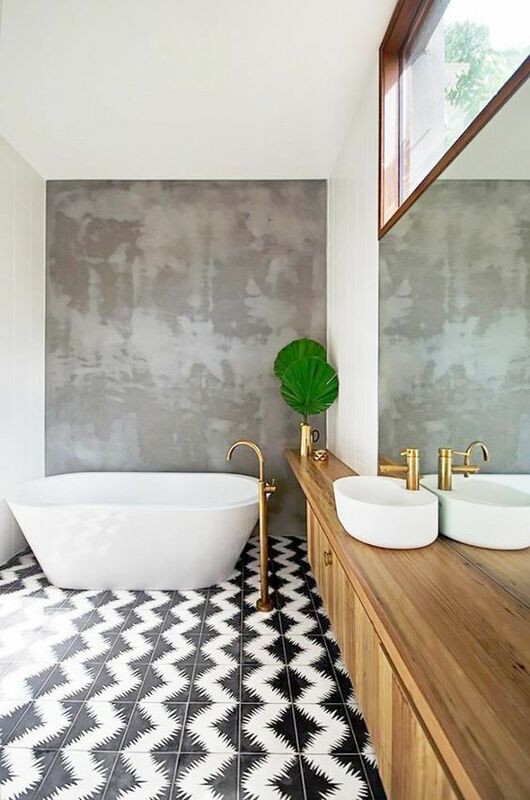 Looking into the most interesting luxurious styles of bathrooms, we’ve selected 4 big themes to create the perfect wellness haven for yourself with the use of mosaic elements. 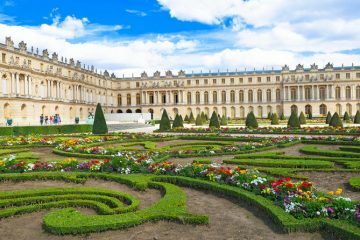 Classical French bathrooms are known as favorites of many interior designers. Characterized by a lavish use of classical patterns, ceramics and wall paneling, they flaunt high ceilings and traditional fittings highlighted with huge mirrors and gilded accents. 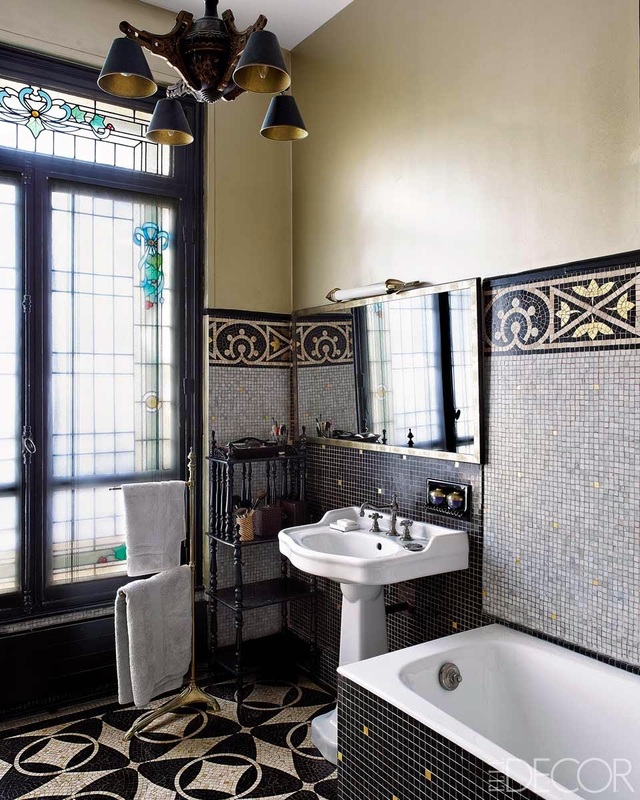 Black and gold mosaic ornaments in this stylish Parisian bathroom take us to the era of Art Deco, but also give one relatively small-sized space a sense of extravagance. Nothing is excessive here, and the visual effect is supremely elegant. French country style and Provencal decoration are known for the use of natural materials, light colors, hand-woven textiles and frilly elements, but always with a sense of measure. White, beige, light blues and yellows are common in a Provencal palette. 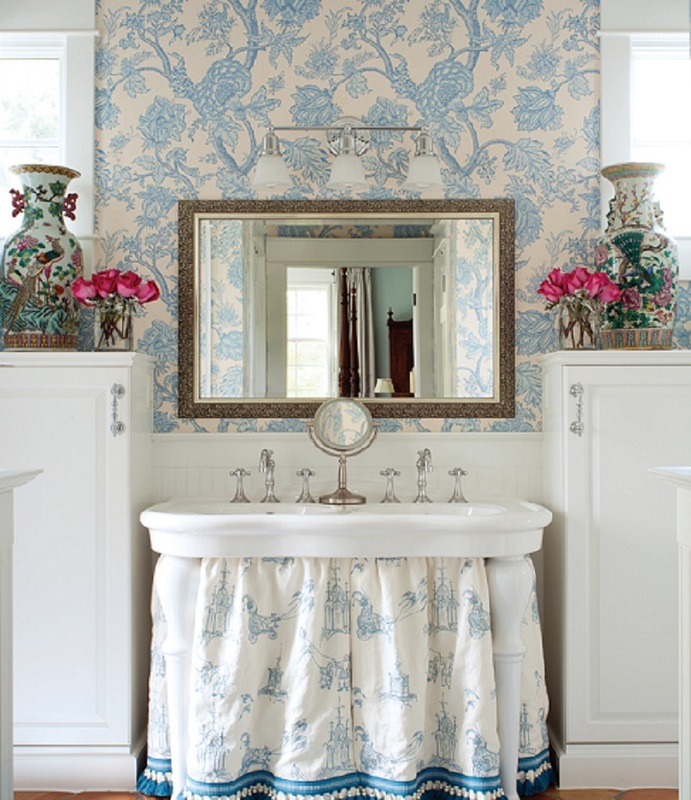 If you are lucky to have a spacious bathroom with lots of light, French country might be a good style to follow. 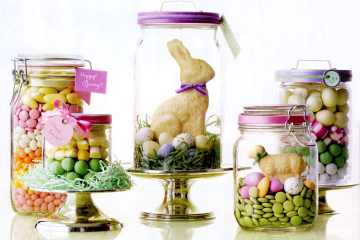 Make sure that your fittings are spotless, classic and that there are lots of flowers and floral ornaments. As for the mosaic feature, it can go either on the floor or on the upper portions of walls (instead wallpaper in our image) and give a more antiquated and refined feel to the area. For those who desire more grandeur in their private spa, Italian villas are a good inspiration. 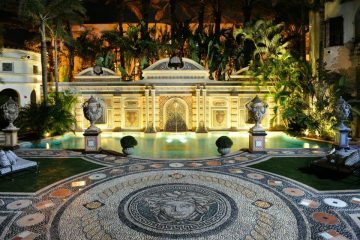 With mosaic floor and wall portions reinterpreting ancient ornamental pieces, these spaces achieve a timeless, royal atmosphere and take your pampering routine to a whole new world. 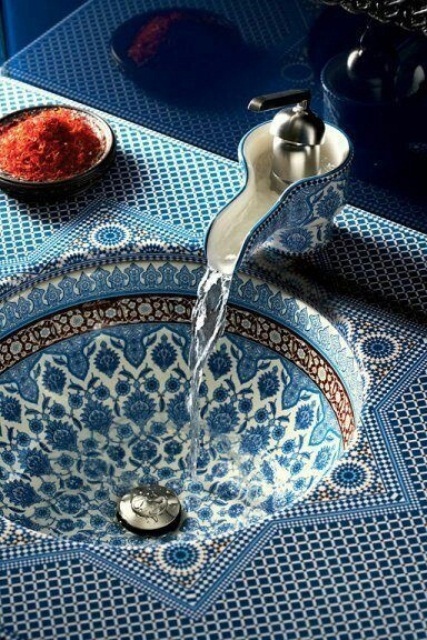 Blue is inevitable when we talk about Mediterranean design, but there are patterns and patterns that can also mix well. With terracotta floor, blue mosaic walls and different white and blue tiles, a bathroom can become a place for casual enjoyment, perfectly supplemented with heaps of natural cosmetics. Floral mosaic details complete the space perfectly. 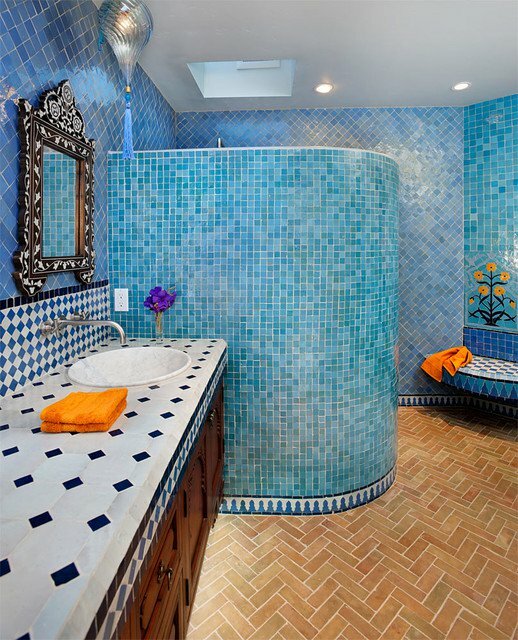 With a few exceptions of explicit florals or custom scenes, Mediterranean bathrooms are dominated by stylized patterned tiles. 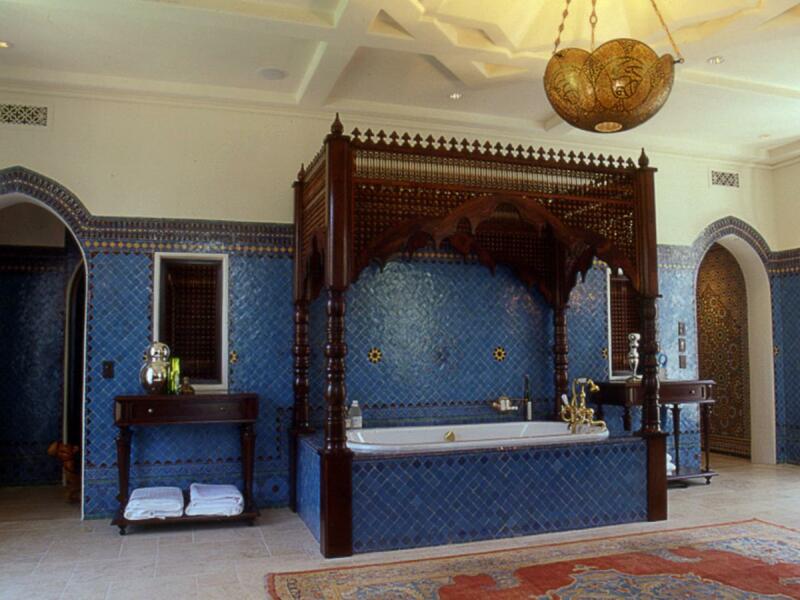 There are countless options to design your bath space evoking the sense of antiquity, splendor, and vogue. The oriental world has always been the place to go in search of hidden private spaces such as baths, harems or secret quarters. 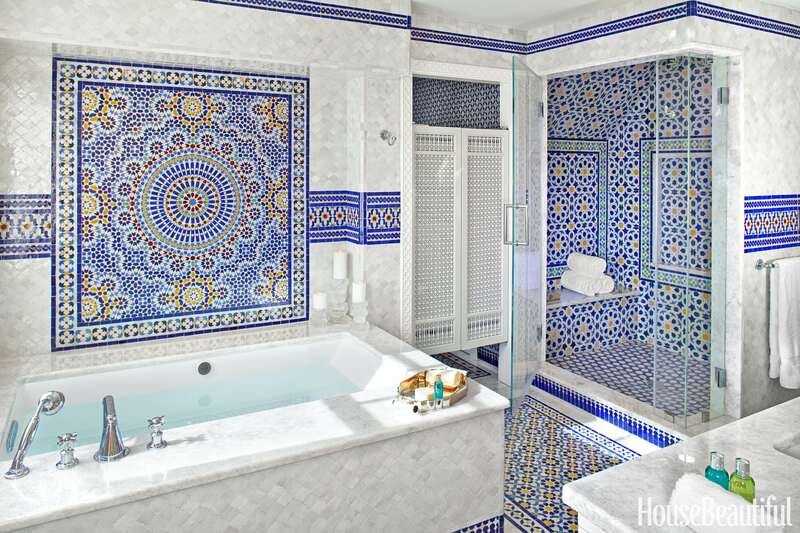 A Morrocan style bathroom represents this spirit perfectly, coated in a hypnotizing opulence of patterns, tiles, and furniture. Everything is subject to enjoyment in such a space, an ideal setting for a relaxing experience. Often supplemented with unexpected furnishings, such as a tea side-table or an armchair, a Moroccan bathroom is not only a place to wash – it’s a salon where one can sit alone or with the most intimate friends and indulge. The palette is usually dominated by many shades of blue, accentuated with green, white, light gray or purple. Darker nuances are used for a more dramatic effect, while the addition of textiles can complete the look. A blue haven with distinct abstract mosaic elements. Take it further by adding more interesting patterns into the design. The focus is put on one important element – the sink – completely covered in oriental tiles, juxtaposing two different patterns. 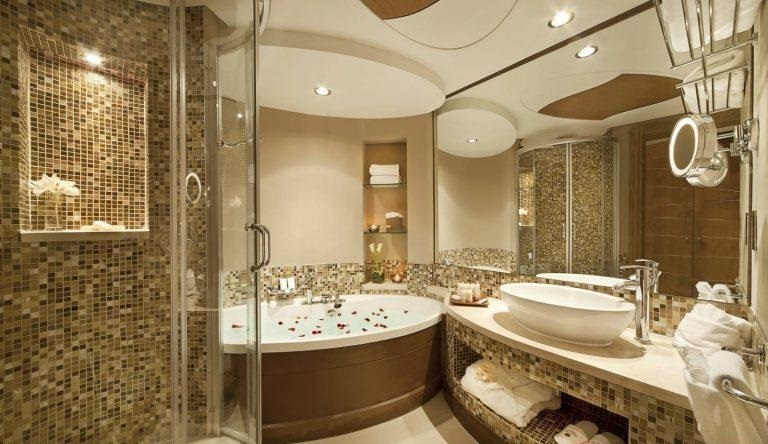 A room for bathing is hardly a bathroom anymore. It grew into a different space, a living room of sorts, where running water is the sign of calm. 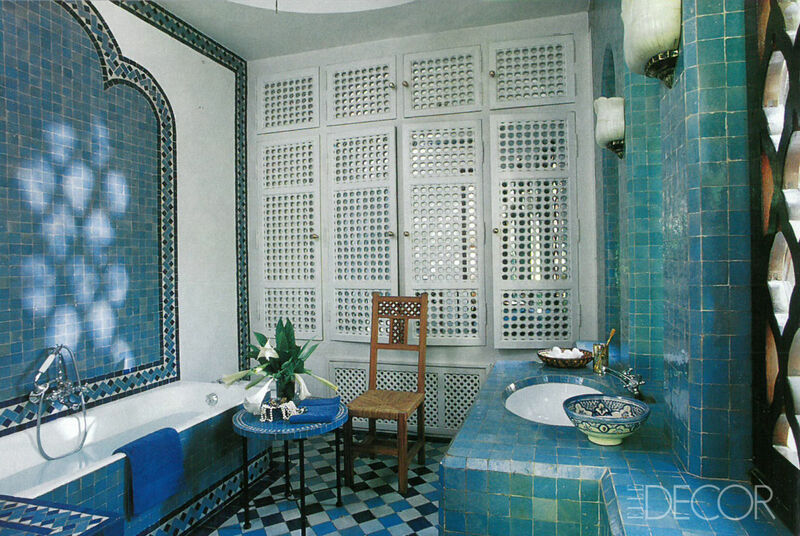 With blue patterned mosaic portions, this bathroom is a wonderful example of classical-meets-Moroccan. An inspiration easily applied to the most of modern lavatories. Dark walls offset with white floors are quite usual for the restrained Scandinavian bathrooms. We expect the practical side to be in focus, but this does not mean that the hedonistic element is not there. Combining ceramics, wood, concrete and mosaic elements, a clean aesthetics of these spaces is achieved. Carefully selected accents give out the sense of unpretentious luxury, where textures, patterns, and materials are everything. Black and white floor mosaic – a timeless pattern for a simple, yet lavish bathroom. 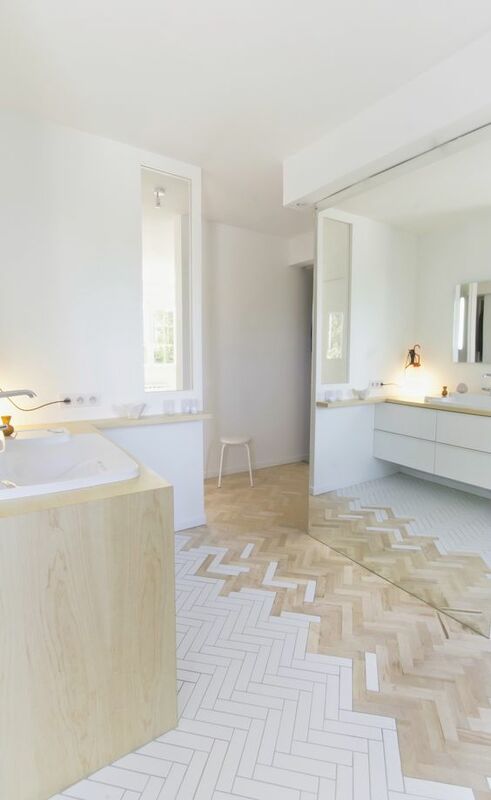 An unexpected floor mosaic combines white tiles and wooden parquet (or tiles in the color of wood), showing us that a mosaic pattern can play with textures as much as with colors. Here, the dominating nuance is a simple white. Many will agree that there is nothing more luxurious than gold. Gilded elements are common in home decor, usually found in picture frames or small accents making an interior more appealing and refined. 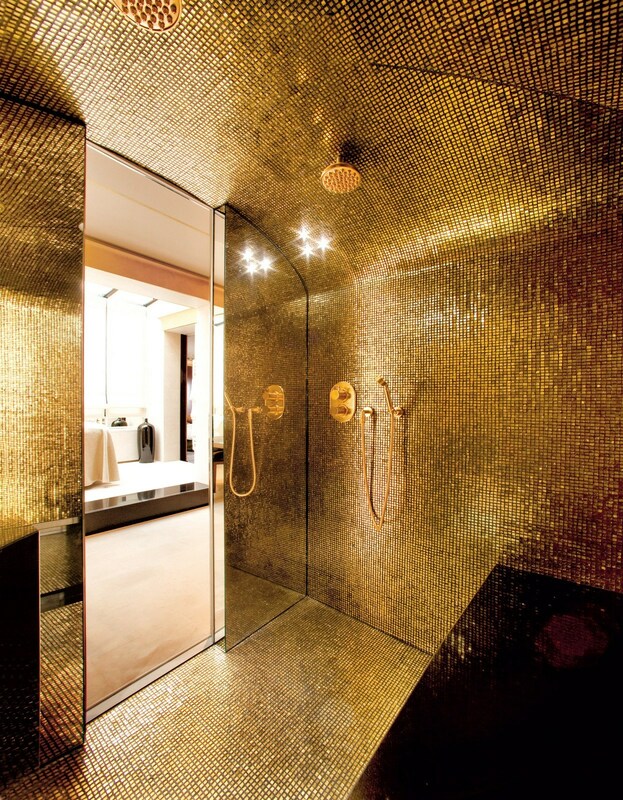 However, when we talk about a golden luxury in a bathroom, we must turn to total design and let gold take over space. Going overboard with gold does not have to slide into kitsch, as long as the other colors and accents are severely toned down and controlled. On the contrary, there is a sophistication only this noble nuance can achieve. Creating a 7-star hotel experience in your home? Why not! 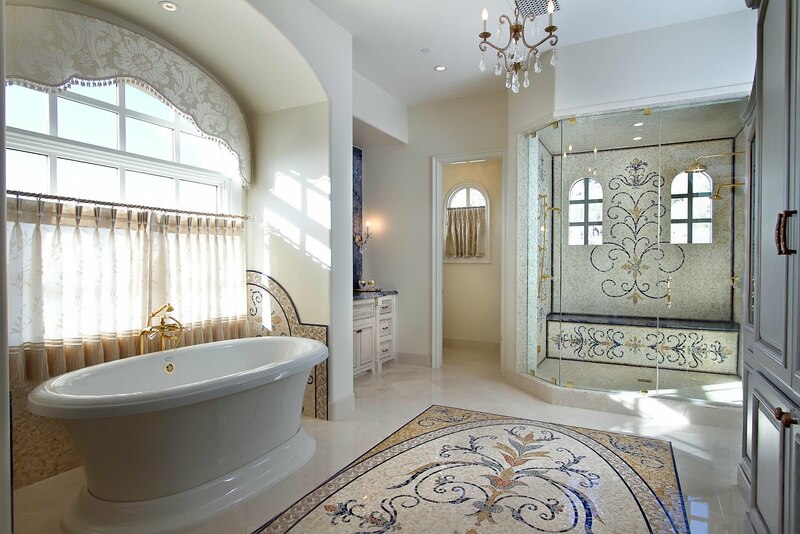 Golden mosaics really exalt the bathroom atmosphere from expected to supremely posh. 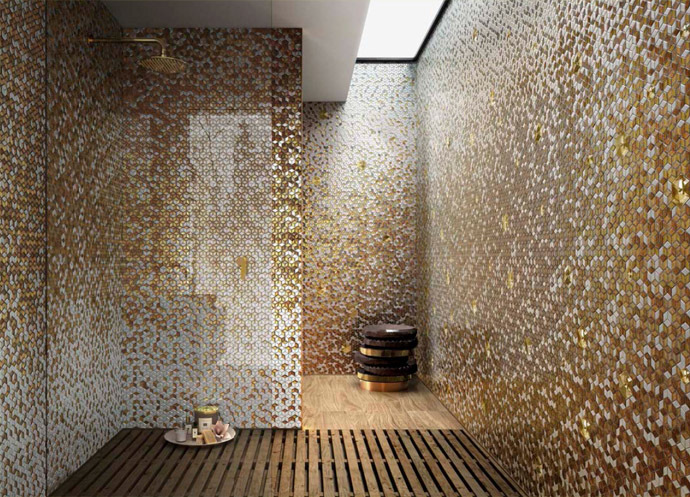 Go beyond hedonism into full decadence covering every inch of the wall in golden mosaic tiles. 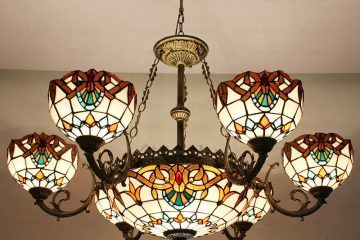 Different nuances introduce more light and glimmer into space. 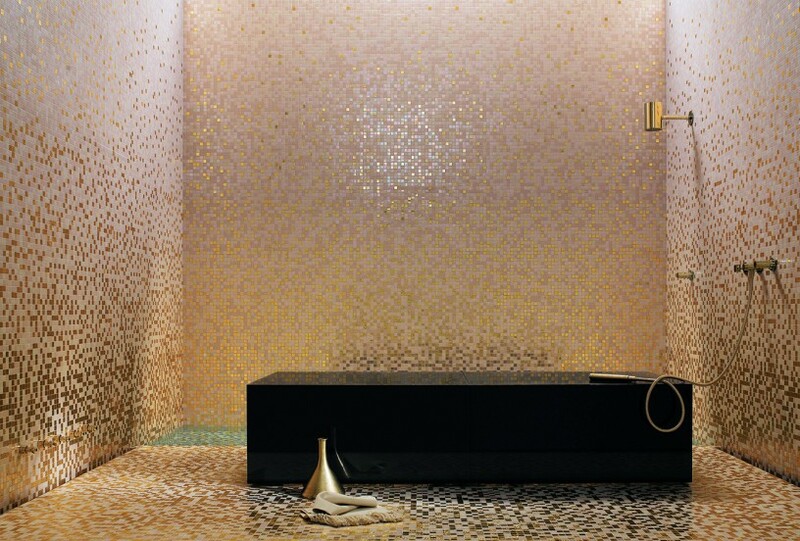 A golden cave can serve as a steam room or a shower room, covered in mosaic tiles from top to bottom. Rich, yet calming, this space promises the finest experience for body and spirit. Inspired by the oriental feel of the hammam, this minimalistic golden bathroom is completely modern, accentuated with only a few minor classical elements. Floor and wall mosaics play the key role in the design, combining different types of gilded tesserae. From a total-look to small accents, incorporating gold into your bathroom will definitely give it a hedonistic feel. Take time to choose from many patterns, designs, and options in the search for the ideal mosaic that will suit your taste and your space alike.